Max Andersson's most recent comics project deals with the subject of family and identity by using actual dreams as the raw material for a graphic novel. The nameless protagonist rediscovers parts of his family among the submerged remains of the family home accidentally unearthed by archaeological excavations. Following attempts to re-establish family ties, it soon becomes apparent that things are not quite as they used to be. A corpse without a face under the kitchen table, a pornographic reality show in the neighbors' apartment and a luxury restaurant with public showers in the basement are just a few of the ingredients in the surreal murder mystery that eventually lead the blood relatives into an epic maze filled with dramatic twists and turns, violent confrontations as well as redeeming situation comedy. While the characters change their appearance as frequently and unpredictably as the surroundings, the plot is driven relentlessly from one nail-biting cliffhanger to the next over the course of the story's seven chapters totaling over 370 pages. 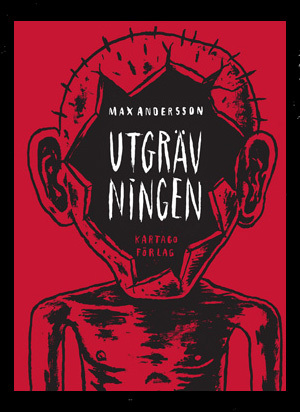 The simultaneously nightmarish and touching that is Max Andersson's hallmark also permeates this story, from the both ambiguously enigmatic and deceptively simple drawings to the black margins where free-floating characters form a universe of their own that expands far beyond the book's covers. The work's creation period spanning 18 years - incidentally the same amount of time traditionally awarded to the process of "growing up" - has resulted in a rare organic narrative, a fragmented and fermented family chronicle extracted from layers upon layers of sediments which constitute the vast inner coral reefs also known as the subconscious. The first five chapters were previously published separately and in a different format in Max Andersson's solo comic book DEATH AND CANDY (Fantagraphics Books, 1999 - 2005) and other anthologies : “The Excavation” (Death & Candy #1, Galago #51 , Schokoriegel #13, Plaque #01) “Sightseeing” (Death & Candy #2, Galago #63 ), “The Viewers” (Death & Candy #3, Galago #72 ), “The Execution” (Death & Candy #4) and "The Shooting" (Galago #119).